Take time the week school gets out to fill out the registration forms for the upcoming school year. It will feel much better to know this task is complete, rather than have it hanging over your head all summer long. 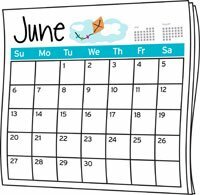 Record important dates for the upcoming school year on the calendar now. Include dates like the first day of school, school holidays, and so on. If you didn’t get these dates from your school yet, they’re probably posted on your district’s website. By taking a few simple action steps now, you can clear away last year’s school paper clutter and really enjoy your vacation from school paper!